Jerusalem Artichokes may not be much to look at, but beneath that knobbly exterior is a nutty, sweet and earthy treat. 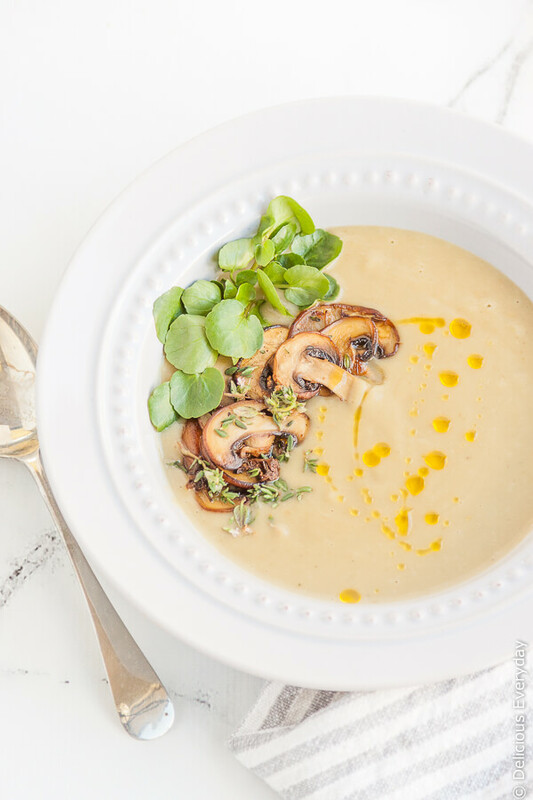 This velvety smooth Jerusalem Artichoke soup is topped with mushrooms and watercress for a complete meal in a bowl. The eagle-eyed amongst you may have noticed I’ve been quiet for a little while. There are a couple of reasons for that. Firstly I’ve recently completed a 2 week food styling assignment for a national food chain, which has kept me busy. Secondly, I’ve been working behind the scenes on a makeover for Delicious Everyday, and I’m finally here to reveal the new look to you! If you’re reading this in a feed reader head on over and check it out. Gone is the garish pink, replaced by soft and subtle citrus tones. There’s also a gorgeous new logo, which I absolutely adore. Strangely I somehow feel reinvigorated with the new look, which feels so much more me than the previous logos and colours ever were. I hope you love it as much as I do. There has also been another change. For a long time I’d been unhappy with the ads I needed to run to support the costs involved with blogging. The increase in the number of noisy, autoplay video ads were the final straw, so, now, in place of ad network ads I will be offering 2, image only ads, to sponsors on a monthly basis where their ads will be the only ones that appear. This month, and next month, the wonderful people at Just Fair Coffee, who offer a great range of fair trade organic coffee products, are sponsoring Delicious Everyday. Going forward I’ll only be working with brands that fit within the ethos of the blog, and ideally I’d love to help wonderful small businesses with great vegetarian, vegan or gluten-free products get their name and products in the spotlight. If you have a product that you think is suitable, and would like to sponsor Delicious Everyday and get your products in front a dedicated audience in your niche, please contact me to find out more. Jerusalem Artichokes, also called Sunchokes, are a member of the sunflower family, and resemble nothing of the green flowering Globe Artichokes that they happen to share a name with. Gnarly and nobbly, just like ginger, they aren’t the prettiest thing out there, but are so worth getting your hands on if you can. Cut into a Jeruslam Artichoke, and the texture is similar to water chestnuts, while the creamy flesh is slightly sweet and earthy flavourwise, with, I think at least, a slight smokiness. 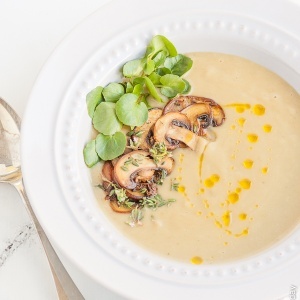 This earthy sweetness works beautifully in this soup along with the mushrooms and the slight pepperiness of watercress. If you don’t feel like frying up mushrooms, a little truffle oil would be fantastic drizzled on top. I’ve used some potato in this soup to balance out the earthiness of the artichokes, but, if you love bolder flavours, feel free to replace the potato with more artichoke. So tell me, have you tried Jerusalem Artichoke? What are your favourite Jerusalem Artichoke recipes? Scrub the artichokes to remove any dirt. It's up to you whether you peel them. I've made this soup with peeled and unpeeled artichoke and prefer the artichoke to be peeled both from a colour perspective and flavourwise as the peeled artichoke is less bitter. Chop the artichoke into 2 cm, <g class="gr_ gr_278 gr-alert gr_spell ContextualSpelling multiReplace" id="278" data-gr-id="278">3 inch</g> cubes. Place 2 tbs of olive oil in a large saucepan over a low heat and add the onions. Season the onions with salt, and cook, slowly, until soft. Don't rush the onions by turning up the heat as the <g class="gr_ gr_270 gr-alert gr_spell ContextualSpelling ins-del multiReplace" id="270" data-gr-id="270">slow cooked</g> onions are much sweeter and more flavourful. Add the garlic and cook for a few minutes, until fragrant. Add the artichoke and potatoes and cook for 5 minutes before adding the vegetable stock. Season and bring to a simmer. Cook until the potato and artichoke <g class="gr_ gr_284 gr-alert gr_gramm Grammar multiReplace" id="284" data-gr-id="284">is</g> tender. I prefer the silky smoothness that blended soups have, so I leave my soup to cool for 20 minutes before blending. If you don't have a blender, or don't want to wait, use an immersion blender and blend until smooth. Check the seasonings and adjust as necessary. Keep warm while you cook the mushrooms. Place a frying pan over a medium-high heat and add 1tbs olive oil. Add half the mushrooms, making sure they are not overlapping, and fry on each side for 3 to 4 minutes, until lightly golden before turning. Season with salt and pepper just before removing from the pan. Repeat with the remaining mushrooms. 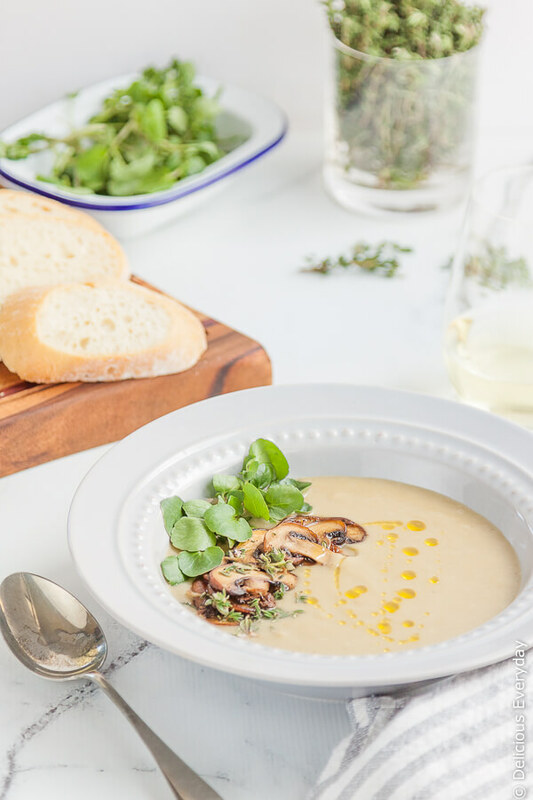 To <g class="gr_ gr_274 gr-alert gr_gramm Grammar only-ins replaceWithoutSep" id="274" data-gr-id="274">serve</g> divide the soup between serving bowls and top with mushrooms and watercress. 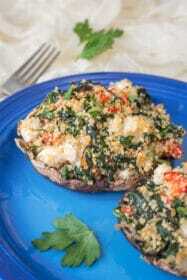 Finish with a drizzle of extra virgin olive oil and a sprinkle of thyme leaves. Made this soup tonight….so good, I actually combined this recipe with another recipe I found on Pinterest – Creamy sun choke soup with asparagus. Basically I made your recipe but also sautéed asparagus with the artichoke and potato. I puréed the soup and added the sautéed wild mushrooms. We loved it! You’re welcome 🙂 It’s easy to spread the mushroom love when mushrooms are so delicious!! I LOVE jerusalem artichokes, such an unusual flavour! But it’s really difficult to get them where I live. I absolutely love the new look and logo! Sometimes a makeover is all we need to feel refreshed and inspired … a bit like buying a new lipstick 😉 I have to admit that I have never tried Jerusalem artichokes before. But I’m always looking for new ideas for vegetable soups so I will have to save this recipe! Fabulous looking soup! I love the new logo!